Most of the time, your Model Offshore Trust will simply take care of itself. It ordinarily will require nothing from you as Grantor, as Protector or as a member of the Beneficiary Class. Yet the Trust will touch you every day. You will be less concerned when you read about the government’s new spending plans and its need for more revenue, because you have a vehicle for protecting investment earnings from taxes. You’ll no longer carry the uncomfortable thought that your entire financial life lies open to view for any curious party, since part of it — as much as you want — resides in the Zone of Privacy. You will be free of worry over future threats of ruinous lawsuits. Your wealth will be beyond the reach of U.S. litigation. And you will be less anxious about the problems the world may present to your children and grandchildren. You know they will have the Trust to turn to in times of trouble — an international “Red Cross” dedicated to their well-being. 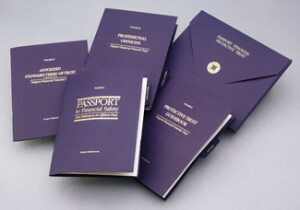 The easiest, quickest and least expensive way to achieve the high sense of safety that comes with a Model Offshore Trust is by using the Passport Financial Trust Kit. Setting up a Model Offshore Trust requires effort from you. But after you've put everything together, the structure requires little continuing attention. You can continue to manage the Trust's investments, just as you manage your investments today. What changes is your level of safety. You'll have the comfort and confidence that Trust assets are protected from lawsuits, seizures and any future restrictions on exporting capital from the U.S. The easiest way -- and also the quickest and least expensive way -- to establish an offshore trust that follows the pattern on the Model Offshore Trust is to use Passport Financial's International Trust Kit.